Native to parts of Europe and Asia, tart cherry is a species of cherry that has high acidity. For this reason, it is less popular compared to common table varieties. It is hardly taken as a fresh fruit, but used as an ingredient in desserts, meat dishes and soups. However, tart cherry juice benefits your overall health and a number of medical conditions. Tart cherry is also available as a supplement. Tart cherries are full of antioxidant benefits of five different anthocyanins. The antioxidants are absorbed in the bloodstream readily and can remain in the blood for 12 hours. The anthocyanins can reduce inflammation and joint pain. According to a research, 400 mg/kg of body weight anthocyanins produce equivalent benefits of indomethacin, a prescription non-steroid anti-inflammatory drug. Tart cherry juice benefits your metallic health and may regulate blood sugar, cholesterol and insulin levels. Studies show that anthocyanins in tart cherries influence genes that are responsible for metabolism of carbohydrates, fats and proteins. In an animal study, lowered cholesterol levels, decreased inflammation and reduced abdominal fat are the results of diet supplements that contained 1 % tart cherry powder. If you take tart cherry juice after working out, your muscles can recover faster. A study on long distant runners who take tart cherry juice five days prior, during and two days after the marathon shows reduced recovery time, decreased oxidized lipids level, less inflammation as well as improved strength. Melatonin, a hormone found in the brain to coordinate your internal clock, is naturally found in tart cherries. Melatonin in tart cherry juice benefits your sleep and helps treat insomnia. Volunteers who take tart cherry juice for seven days find that their ability to sleep and stay asleep as well as the length of sleep improves. New studies have shown that tart cherry juice can be used to deal with gout. Gout is caused by uric acid in high concentration and a biomarker of inflammation called c-reactive. 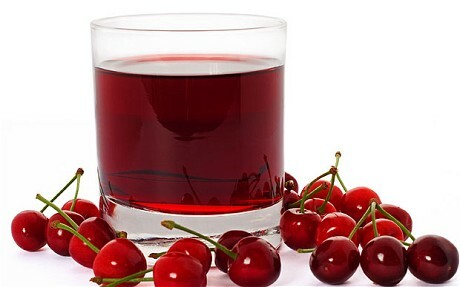 Tart cherry juice can reduce the levels of uric acid in the body and relieve gout. Tart cherries can improve your body’s capability to adjust metabolism and thus prevent obesity. A study with rats attributes that tart cherries are able to reduce abdominal fat, inflammation and the risk of metabolic syndrome. Tart cherry can activate peroxisome proliferator activating receptors (PPAR) which assist genes to regulate glucose and fat metabolism. Activation of PPAR reduces the risk of heart disease and stroke. Tart cherry juice could have equivalent results as prescription PPAR drugs. Scientists have discovered that tart cherries are a warehouse of nutrients that serve as natural healers. Drinking tart cherry juice benefits people with neurodegenerative disorders. Studies have shown that anthocyanins can protect neurons by reducing oxidative stress damages. Some researchers have even suggested that tart cherry juice can help cure Parkinson’s disease by mending the cells that interfere with the functions of the brain. Due to high sorbitol content, tart cherry juice can cause side effects like diarrhea and abdominal discomfort. Sorbitol is a type of sugar that is difficult to absorb into the small intestines and can cause digestion problems. The undigested sorbitol works as a fermentation substrate that is a friendly environment for bacteria in the large intestine. This, in turn, leads to production of hydrogen gas causes bloating, abdominal pain, flatulence as well as diarrhea. Sorbitol also disrupts the osmotic balance in the large intestine and too much water may get in, leading to loose stool. Taking tart cherry juice can cause or worsen IBS (irritable bowel syndrome). If you would like to use tart cherry juice to deal with inflammatory conditions or gout, start with small portions and use brands that do not add sweeteners. There is no standard dosage for tart cherry juice. In studies that have been conducted, subjects took the juice twice a day mostly for more than seven days before the results were examined. What Happens If You Eat a Bad Egg?